How to get the stripes in the tube? How does the soap finds the dirt? Why is an egg after cooking hard-boiled? I don´t know, but I know how to get the tooth paste out of the tube. 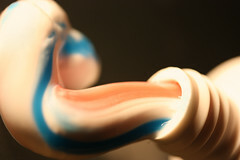 What a bummer, that i can´t photograph the aroma of the tooth paste who is in the air. Fancy that! And dont forget: Brush your teeth, also your false teeth. I am playing a little bit with the light and the shadow. Today the natural light is in Germany a curiosity. It is lunch time and i have to use the light switch. Wie kommen die Streifen in die Tube? Wie findet Seife den Schmutz? Schade, dass man den Geruch noch nicht mitfotografieren kann. Den mußt Du Dir dazu denken. Ansonsten habe ich einfach nur versucht meine Zahnpastatube in Szene zu setzen- mit weichem Licht. Also: Zähneputzen nicht vergessen!